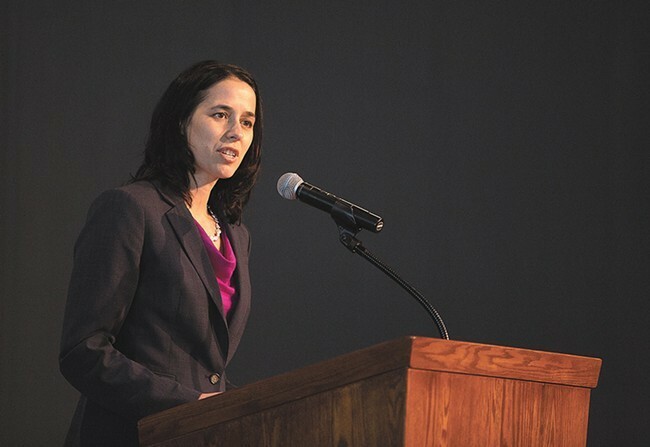 Shelly O'Quinn is taking a job as CEO of the Inland Northwest Community Foundation. Not long ago, Shelly O'Quinn was running for a second term on the Spokane County Board of Commissioners. She said she was excited for the opportunity to serve another four years, and saw an opportunity to continue changing the culture of county government, save taxpayers money and push for criminal justice reform. But now, five months after she soundly defeated challenger Andrew Biviano to keep her seat, O'Quinn has announced she is leaving the board. She has accepted a job as Chief Executive Officer of the Inland Northwest Community Foundation, effective in June. "I will tell you, the hardest part of leaving the county is leaving the work that I'm working on," O'Quinn tells the Inlander. "It was a difficult decision, from the perspective that I absolutely love my job with the county." She says she would not have left for any organization other than the Inland Northwest Community Foundation, a nonprofit corporation where she previously worked in 2007-08 as a senior program officer. She says she fundamentally believes in the work the foundation does, including its support for local projects like Priority Spokane, which works to stabilize lives of homeless or at-risk children. The current president and CEO of the foundation announced plans to retire last September, when O'Quinn was in the middle of her re-election bid. O'Quinn says she wasn't sure about seeking the job when it was posted in January. She says she did "a lot of soul-searching," but ultimately decided this was a once-in-a-lifetime opportunity. "The timing on this is the unfortunate piece," she says. "In an ideal world, I would have loved to finish out my term." O'Quinn says she is proud of her work to invest in "lean management" processes that she says have saved taxpayers millions, and to create a "culture of project management" with improved efficiency and customer service. The county, she says, is also doing "phenomenal work" around criminal justice reform efforts. The change, she says, was not motivated by any internal issues with the county employees or other commissioners. In a statement, commissioner Al French said O'Quinn's leadership with the county would be "sorely missed." "It will be difficult to see Commissioner O'Quinn leave the board, but I'm glad that she'll be accepting a position that has such an influence in our community." Commissioner Josh Kerns echoed that statement. "Commissioner O'Quinn has been a tremendous positive force for Spokane County since she was elected in 2012. It's going to be a challenge for the county to lose such a committed leader, but I'm excited for the opportunity Shelly has ahead of her." Spokane County Republican precinct committee officers, or PCOs, will vote on three nominees to replace O'Quinn. Those nominees will then be sent to French and Kerns, the remaining county commissioners, who can choose to confirm one of the nominees. The seat will then be up for election, but the filing deadline for 2017 is in May, before O'Quinn officially leaves. That means the election will have to wait until 2018, says county spokesman Jared Webley. The seat will then be up for election again in 2020, the year O'Quinn's term would have ended had she stayed. O'Quinn expressed doubts that she would return to politics in the future. "I think I've been very consistent in saying that politics is not a career for me," she says. "I said that from the very beginning. We serve our time, then go back to the community." Is this the homeless shelter of the future?